After a long wait after the removal of PvP Wilderness and the addition of Bounty Hunter, it finally arrived. This guide will tell you all you need to know about this unique one-versus-one Player Killing Activity. 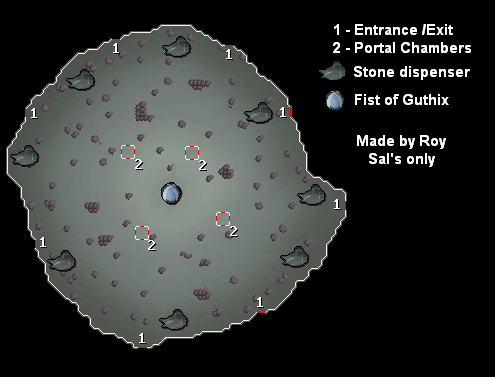 Fist of Guthix can be found in the Gamer's Grotto located just north of Falador, and there are four main methods of getting there. You can use a Ring of Duelling to teleport directly to the Fist of Guthix arena. You can use a Games Necklace to teleport to the Gamer's Grotto. 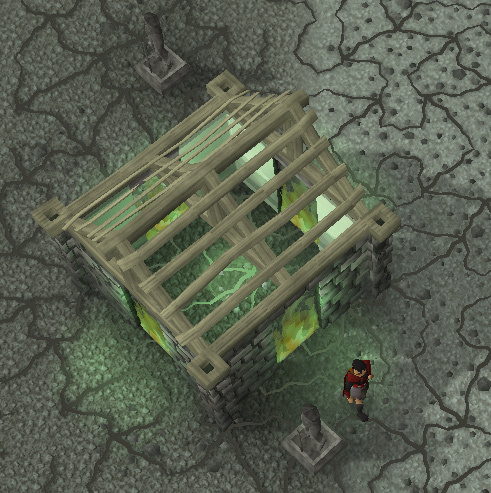 From there, enter the portal to the Fist of Guthix arena. 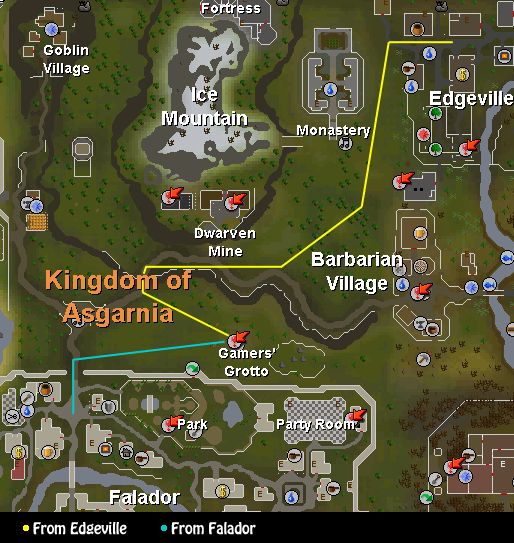 The Gamer's Grotto is located just north of Falador. If you speak to Alran, Pontimer or Getorix they will tell you a little about where you are and who is in charge. Fiara will give you a tutorial which will tell you a bit about Fist of Guthix. There will also be a scoreboard that shows the results of the last 50 completed games. In the top-left corner of your game screen you will see a Rating box. Your rating will change depending on how many charges you win or lose by. This is your Fist of Guthix rating, and will also show on the hiscores if you have over 500 rating and you are in the top 1 million Fist of Guthix players. Note: This is a safe Activity, and you will not lose your items if you die. 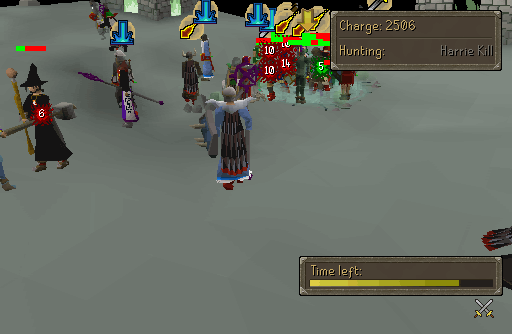 Fist of Guthix is a 1 vs 1 type game with prizes awarded to both f2p and p2p players. Each match has two rounds, in each separate round you will have a turn to be the hunter and the hunted. The hunters main goal is to hunt down the target they are assigned to, and the people being hunted are to collect as many charges as possible before the round ends. The game is based around strategy. When you first enter, a higher level person's stat will be reduced accordingly to their opponents levels. Standing closer to the middle of the arena will cause you to gain charges faster whereas on the outside you will gain charges at a slower rate. When the game starts you get various items that will help you when being the hunter and the hunted. If you win a game your rating will increase and you will get some Fist of Guthix tokens. If you lose your rating will decrease. 300 Catalytic Runes which will count for 300 Non-elemental runes. 1000 Elemental Runes which will count for 1000 Elemental runes. A Tele-orb which can be used to teleport you to the center of the arena once per game. 5 Bandages similar to the ones in Castle Wars which heal 150 Life Points each. If when you start up the top-right corner it says "Hunting: Players name" it means that you are the hunter. Your role is to kill you opponent as fast as possible. Using spells to stop their movement is a good way to do this. When you are the hunted your objective is to stay alive as long as possible and collect the most charges. You gain more charges while near the center of the arena than when you are on the outside. If you are right at the fist you will get 28 charges every few seconds. If you are at the very edge then you will be getting 3 charges every few seconds. As this role the portal houses will help you a lot to get away from your hunter. When hunting turn assist off to make it easier to find your opponent at the center. The maximum amount of charges is 5,000. If your opponent leaves they automatically get 0 charges. There is a time limit between going in and out of portal houses. Mages are by far the strongest combat style for Fist of Guthix. You cannot do non-combat spells (Alchemy, Enchantment) in the arena. There is a 10 minute limit to each round. You cannot use the portals with less than 20 charges. As the hunter you should have some equipment with a decent magic attack bonus so you can use Spells to stop your opponent from moving. At the start of the round as hunter, a good idea is to use your Tele-orb to teleport to the center of the arena and quickly sprint to the opposite edge of the arena which is where your opponent will start 90% of the time. If you get there quick enough your opponent may still be there and you can get in for an easy and quick kill. Most the time they will use the Tele-orb to escape. You should simply run back into the center and use a binding spell on them. If they manage to get to a portal house than you should try and approach them from the outside of the arena to give them less chance of going in one. Just remember your aim: to kill them as fast as possible. As the hunted it is wise to have dragonhide armour and metal armour. The dragonhide armour will protect from magic attacks while the metal armour can protect against range and melee attacks. Don't be afraid to mix and match. People will often wear Karil's Leathertop with Torag's Helmet and Platelegs. If your opponent manages to get close to you or starts using magic spells it is wise to go into a Portal house to escape. Sometimes you could even use the fake portal method which involves you going into the house and waiting for them to run off to another portal. Then you can exit from the same house. 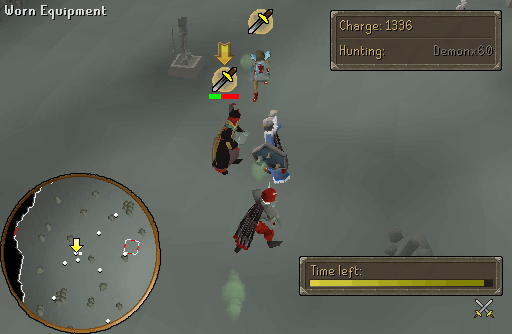 If your opponent is low level melee based then it can sometimes be a good idea to stand right on the Fist of Guthix and have protect from melee and a Defence prayer on. This will allow you to stay for quite a while and be gaining charges very quickly. When you win a game you win a game of Fist of Guthix, along with your rating increase you will get some Fist of Guthix tokens. You can use these at Reggie's shop to buy items or recharge worn out ones. The magic robes, metal gauntlets and shields can be fully uncharged by using them with Reggie. They can only be sold when they have no charge. Some items sell for quite a lot on the grand exchange, for example the Black Dragonhide Coif is one of the best helmets for ranging so it is in high demand. If they have no charge they will have severely reduced stats. 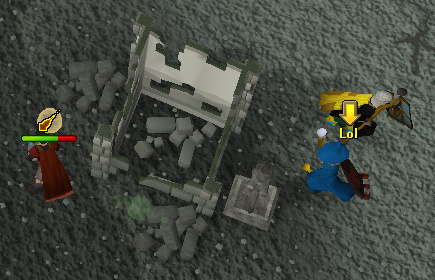 All the magic robes have a set effect and degrade like barrows armour. They can be recharged by Reggie for a small amount of Fist of Guthix tokens. The Battle robes are members only. The set effect of Druidic Mage robes will make your Bind, Snare and entangle spells more effective. While you are wearing a complete set of combat robes, there is a chance that you will not need to use any mind, chaos, death or blood runes when casting a combat spell. Battle robes have the same effect as Combat robes but there is a higher chance of the set effect happening. Rangers would have been wanting these for a long time, dragonhide armour coifs. They range from green to black with blue, red and black being members only. These gauntlets give a range of gloves to wear for non-members and members. Dragon gauntlets are members only. These shield are a mix between their corresponding shield and defender put together. All shields are available to non-members. The herb gloves come in 4 types, irit, avantoe, kwuarm and cadantine. Irit gloves need 50 Herblore to wear, 60 for avantoe, 70 for kwuarm and 80 for cadantine. If you are wearing these gloves then any time that you would receive a herb drop, there is a 50% chance that it will automatically be the same herb as your gloves. Note: This does not apply for monsters like Fever Spiders which only drop one type of herb. These gloves will crumble to dust after you have gotten 100 of the corresponding herb as a drop. These give no stat boosts. Fishing gloves come in 2 types, swordfish and shark. Wearing either one will give you 100xp extra when you catch the same fish as your glove. Swordfish gloves need 65 Fishing to use and Shark need 90 Fishing. Your gloves will crumble to dust after you have caught 1,000 of the corresponding fish with the gloves on. These give no stat boosts. Runecrafting gloves come in 3 types, air, water and earth. They will give double the normal experience when crafting the same type of rune as your gloves. Your gloves will crumble to dust after you have crafted 1,000 of the corresponding runes with them on. These give no stat boosts. Dragon slayer gloves are a great addition to the Slayer skill. While wearing these gloves you will get 10% extra slayer experience when wearing these gloves on a Dragon task of any kind. These will crumble to dust after 1,000 on-task dragon kills. These give no stat boosts.